We breed primarily for health and temperament, with a strong eye for aesthetics. We love our doodles and you will too! We do our best to give our puppies the highest quality of genetic makeup that we can find, then we add healthy doses of socialization, nutrition, and of course LOVE! Click here to view our available puppies! You may view our pricing here. 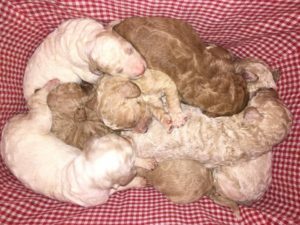 Love My Doodles is a small kennel, we do not breed a lot of dogs to ensure that all of our puppies are well cared for and given the proper amount of attention to develop into strong, happy, lovable pups. Browse through our anticipated schedule and make a deposit on the litter of your choice to avoid missing out! Scroll down to view our parent dogs. Sign up for our mailing list on the right side of this page to stay up to date with us! We currently have some labradoodles available! Visit our Available Puppies page for more info. We have a litter of mini goldendoodles planned for summertime! Please fill out our puppy application if you are interested in any of our puppies. For more information on our puppy parents, please visit our Puppy Parent page.